Anyone who uses computers to create knows that one of the best ways to boost productivity is to add additional screens to your setup. This can be done in several ways. The most direct way is to buy and connect a new display to your system. In addition, applications such as Synergy and Mouse without Borders let you control additional computing devices, such as laptops, using your desktop computer’s mouse and keyboard. For instance, my current development system uses a primary display and an left-hand display. In addition, I use my laptop as a “third display” with things like Twitter, Skype, and IRC running on it. By running Synergy on my desktop computer and my laptop I am abile to freely move my mouse between all three screens, and use my desktop mouse and keyboard with my laptop. Things like copy-and-paste work well too. 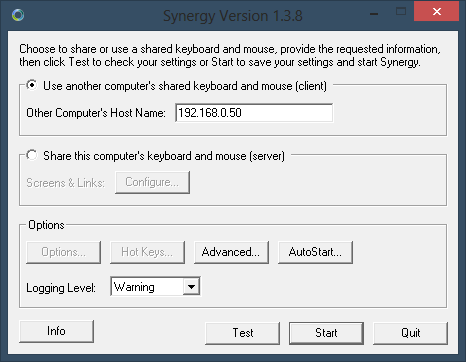 Note that you’ll need to download and run Synergy on your desktop computer as well, and configure Synergy accordingly. If you are using OS X on the desktop, SynergyKM is a friendly Synergy distribution that installs into System Preferences. This is great way to use a Windows RT device as an additional small-form display. It’s also very helpful when developing Windows Store apps or WinForms apps for Windows RT. Once you start remote debugging your Windows Store or WinForms app on your Windows RT device, you can simply move your mouse from your development system to your Windows RT device to debug, easily moving the mouse from the app on Windows RT to the IDE for debugging on your desktop. This entry was posted in Development, Technology on February 11, 2013 by Nathanial Woolls (Nate). After having a particularly good experience exploring and implementing unit tests in Visual Studio 2012 using the code coverage analysis found in the Premium SKU I decided it was time (past time!) to get a similar handle on testing my iOS applications. Now I love Xcode but the tooling is, in my opinion, not as mature as Visual Studio in many respects: debugging experience, testing experience, analysis, and integration for 3rd-parties to name a few. When it comes to unit testing and code coverage with Xcode, the story isn’t nearly as nice as that found in Visual Studio. For instance, your only option for running unit tests is to run all test cases at once. There is no test runner or dedicated UI and there is no way to run individual tests or easily toggle tests (other than individually toggling the membership of .m files in the test target). 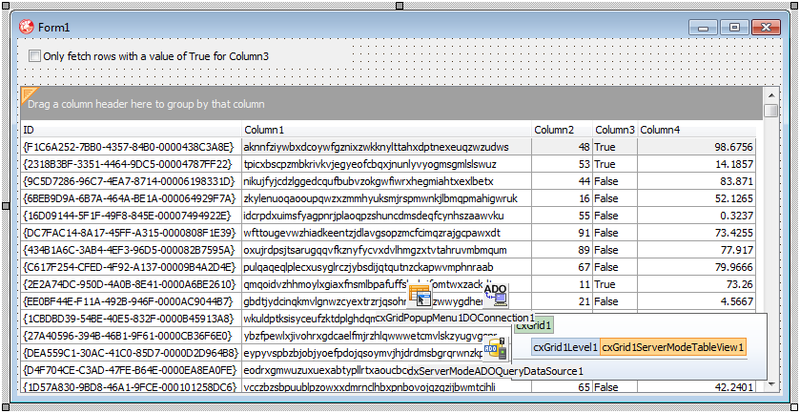 To put it simply, it’s a far cry from Visual Studio’s Test Explorer, much less something like CodeRush’s Test Runner. See the update at the bottom of the post for clarification on this. When it comes to visualizing code coverage with Xcode – specifically iOS apps – there are several steps to take and a 3rd-party application is required. Now, as long as your project is setup with a unit test target, you can click Product and then Test to run your unit tests. If you check the contents of this folder after taking the above steps, you should now see a collection of DIA, GCDA, GCNO, and related files. The next step is to find a friendly way to view these results. There is nothing for this built into Xcode or provided by Apple. 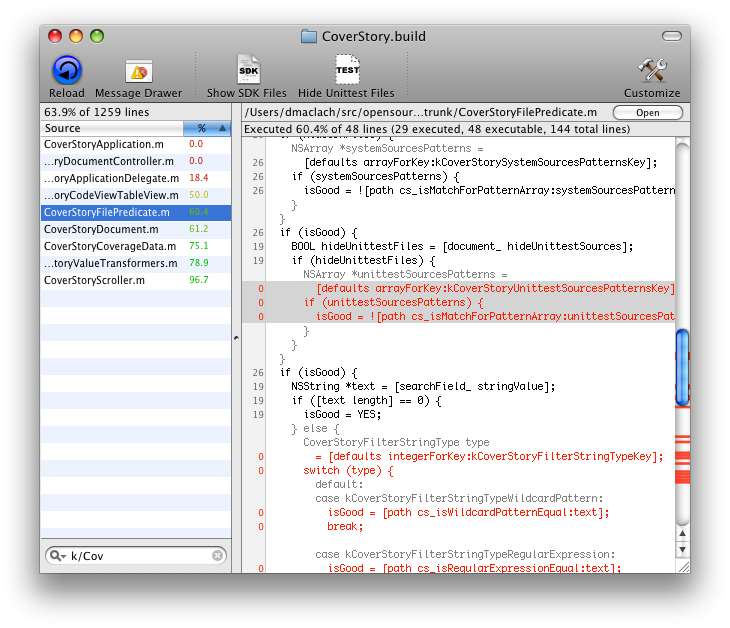 This is where a nice open source application called CoverStory comes in handy. 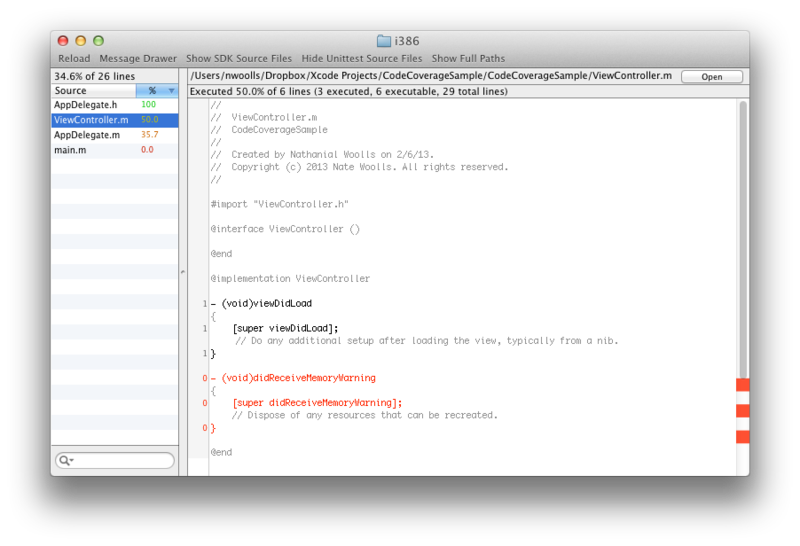 This application loads the files generated by Xcode and displays an output similar to other code coverage tools. You can download CoverStory here. After running the app, click the File menu, then Open, and navigate to the same ridiculous path mentioned previously (press ⌘⇧. to show hidden files & folders in Finder). 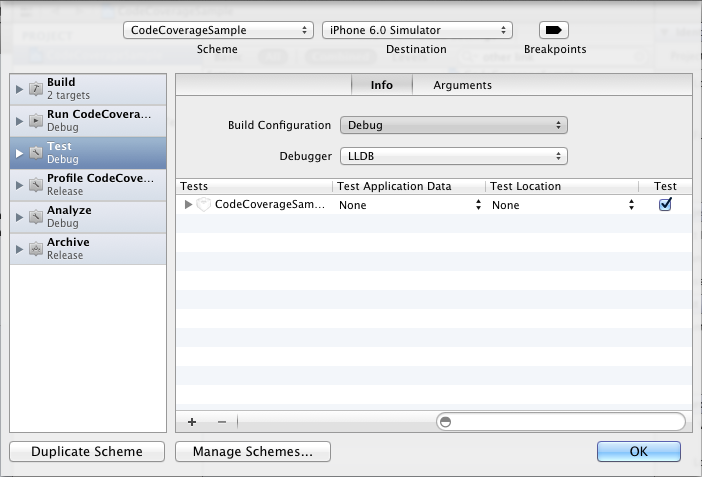 This should display the breakdown of code coverage for your application. Selecting .m files will show the individual lines of code covered by the unit tests. Finally, depending on the linker flags your project uses there may be additional steps required to generate GCDA files with iOS 6. I’ve covered steps for working around that issue in a separate blog post here. My next step will be to look into GHUnit, an alternative to the unit testing bundled into the Xcode IDE (OCUnit). While not integrated into Xcode, GHUnit does offer several improvements such as the ability to run individual tests or failed tests. UPDATE: Martin Pilkington was kind enough to call to my attention that there is another way to enable and disable tests and test cases using Xcode schemes. Click on Product, then Scheme, then Edit Scheme (or press ⌘<). On the left of the scheme sheet select the Test action. On the right, in the list under Tests, you can expand the individual test targets, test cases, and tests, and enable and disable them via the checkbox in the last column. You can also multi-select multiple tests and test cases and right-click to disable or enable a group. Thanks Martin! And while this is absolutely better than toggling the target membership of the .m test case files, I’d still like the ability to easily run a single test or test case. Right now, to target coverage of a single test or test case, I have to disable hundreds (on a larger project) of tests, then work on my one test, only to re-enable hundreds of tests afterwards. What I’d personally like is the sort of simple features found in other unit test runners: easily select and run a single test, a single test case, failing tests, or all tests (without having to manually and individually select which tests to run). 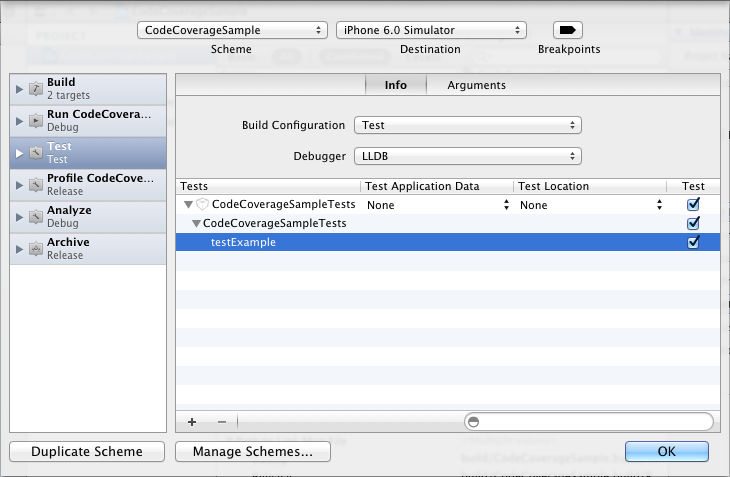 UPDATE: Xcode 5 has since been released by Apple and now includes a full-blown Test Navigator for running unit tests. This entry was posted in Development, Technology, Xcode on February 8, 2013 by Nathanial Woolls (Nate). 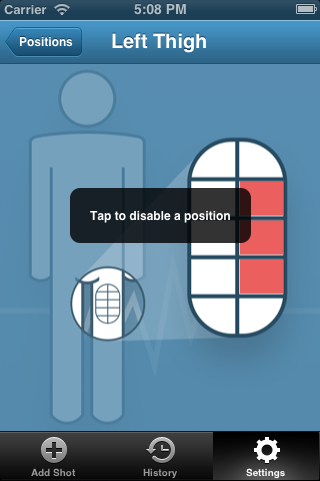 With this update it is now possible to customize these individual disabled positions in the Settings tab. This update also brings localized translations for both Spanish and German. Now, if you have your language in iOS set to either of these languages the text in Hip Shot will be shown in your native language. If you are able to help translate the phrases in Hip Shot, visit hipshotapp.com and click the link at the bottom of the page. This entry was posted in Technology, Xcode on February 1, 2013 by Nathanial Woolls (Nate). Once you have your Windows RT device jailbroken and running your WinForms applications it would be very handy to be able to remotely debug those apps running on Windows RT, similar to what can be done when developing Windows Store apps. The first step is to share the project folder. Right-click the project in the Solution Explorer in Visual Studio and click “Open Folder in File Explorer”. Then use the context menu in Explorer to share the folder with a common Windows user. 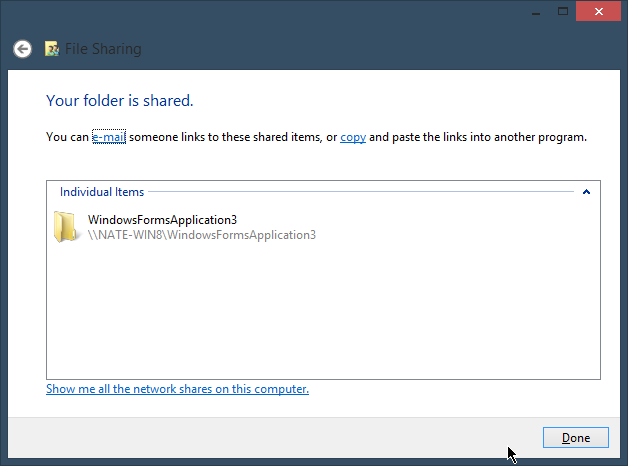 The basic sharing wizard worked fine in my testing. Next we need to setup debugging for the project. Unlike a Windows Store application the remote debugger options aren’t available from the Start debugging button in VS2012. 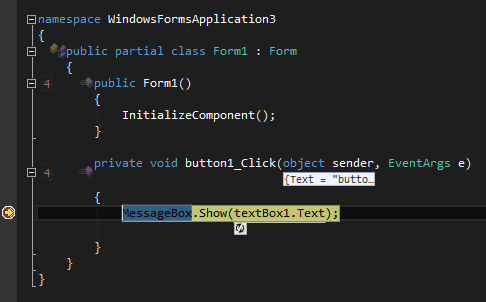 Each project type in Visual Studio seems to surface its remote debugging options in a slightly different way. Right-click the project in Solution Explorer and click Properties. On the Debug tab, select “Start external program” and enter the path to your exe using the UNC (network) path. Then, check “Use remote machine” and enter either the computer name or IP of your Windows RT device. Switch to the Windows RT device and start the Remote Debugger from the Start screen. If you do not have the Remote Debugger for Windows RT installed you can download the Remote Tools for Visual Studio 2012 on your Windows RT device here, under Additional software. Make sure you select the ARM download. 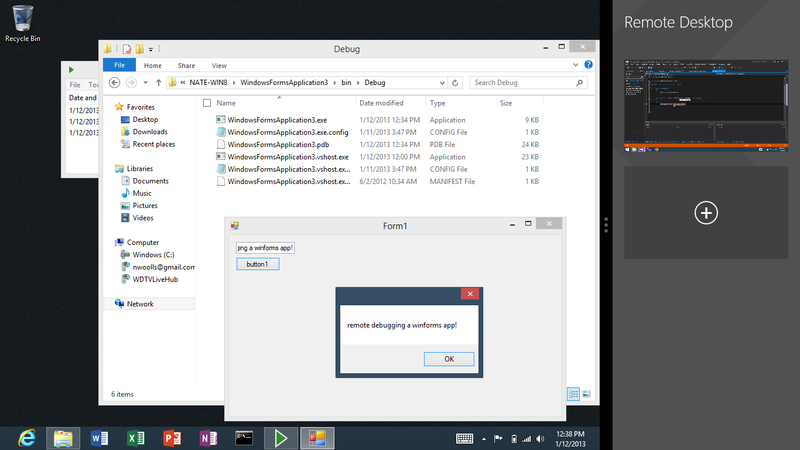 With the Remote Debugger running on your Windows RT device, you should now be able to click Play in VS2012. 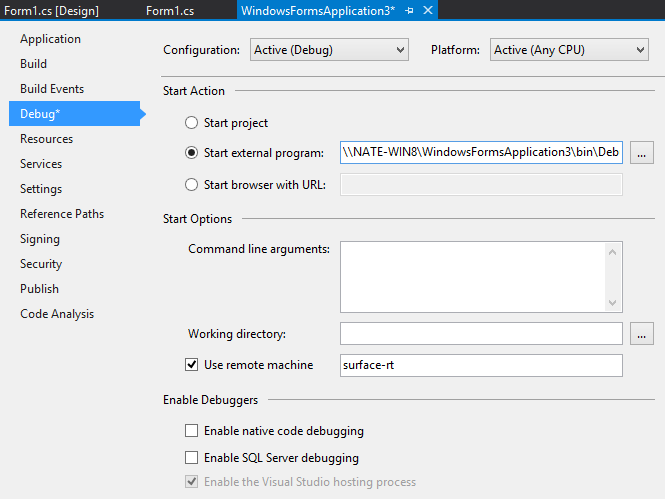 The application will launch on your Windows RT device, and you can set breakpoints and debug as you normally would. Throw in the Remote Desktop app in Windows RT along with the split screen feature and you’ll be debugging from your couch in no time! This entry was posted in Development, Microsoft .NET on January 12, 2013 by Nathanial Woolls (Nate). I’ve been following the developments on the home-brew front for Windows RT for the past few months. As you’ve probably heard, a “jailbreak” for Windows RT was documented several days ago. 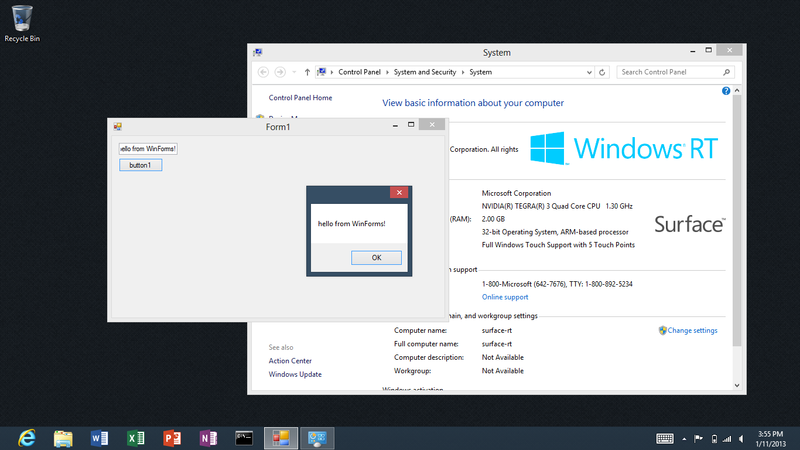 This “jailbreak” allows the user to run desktop applications that are not signed by Microsoft. You can ready more about how the exploit works here. The original exploit was pretty difficult to do and involved using a combination of a Windows Store app to open a command prompt that is then able to run some unsigned applications, and then using that command prompt to exploit a bug in Windows RT that stores a new value in memory used when checking if an app is signed. The actual exploit also required the user to use remote debugging from VS2012 in order to get the exploit payload into memory on the Windows RT device and then setting several breakpoints, redirecting the RT device to that payload in memory. Yikes. This mostly just led me to BSOD my device repeatedly. However, a couple of days ago a much simpler jailbreak tool was released that just involves a double-click and following a few prompts. You can read about the tool and download it here. 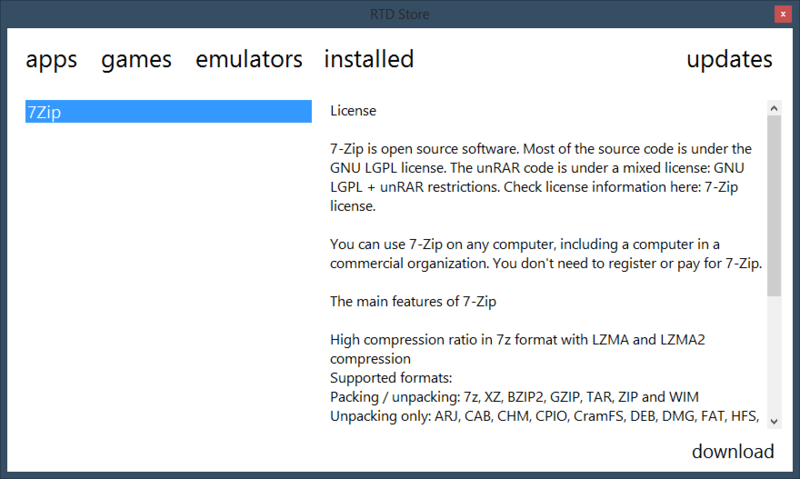 Once you have Windows RT able to run unsigned desktop apps you can download a whole set of FOSS apps that have been recompiled for ARM such as Notepad++, PuTTY, bochs, and 7-Zip. The list is growing daily, and there’s even an app you can install on Windows RT that makes for a non-official “RT Desktop Store”. One of the very cool and often overlooked aspect of all this, though, is that any pure .NET 4.5 application will also run on Windows RT once jailbroken. I tested this myself and it worked without any extra steps. I created a new C# .NET 4.5 application and was able to run it, unmodified, on my Surface RT. Microsoft has stated that they do not see the current jailbreak as a security vulnerability, though they could also (obviously) not promise that the exploit will remain unpatched. If you want to ensure your device remains “vulnerable” there are steps to disable automatic updated for Windows RT here. This entry was posted in Development, Microsoft .NET, Technology on January 12, 2013 by Nathanial Woolls (Nate). 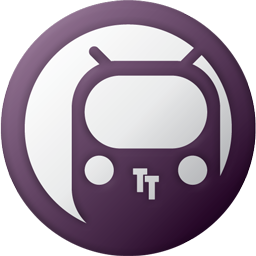 In the end I created two scripts: RunTests.train and BuildRelease.train. By naming my scripts with a .train extension I was able to associate them with Train.exe and can run my unit tests and build releases with a simple double-click. The script is pretty straight-forward. It builds release versions of my unit test assemblies using the msbuild API provided by Train (API documentation can be found here). It then defines a simple function – runTest – for running unit tests with MSTest.exe using the shell API. Finally, the function is called for each unit test assembly. This script is a bit more complex but still pretty easy to understand. It starts by using the Train API to run the RunTests script. Because of the nature of MSTest.exe and Train.exe, if the RunTests.train script fails then the BuildRelease.train script will be aborted. The script then uses Train’s ini API to read a configurable version from VersionInfo.ini. Next, the msbuild API is used to both update the assembly version information and build release versions of each assembly. This bit of ISPP macro code will make use of the ES_AppVersion environment variable set by the BuildRelease.train script to define the installer’s version. Finally, the last lines of the BuildRelease.train script use the folder and file Train API’s to copy the created installer to a folder named after the version read from the INI file. So far I’m very happy with Train as a simple, capable tool for automated testing and building. If you’d like to read more about Train you can refer to Marc Hoffman’s post on the project as well as the official documentation. This entry was posted in Development, Microsoft .NET, RemObjects on January 10, 2013 by Nathanial Woolls (Nate). Version 12.2 of the DevExpress VCL controls brings several improvements to the Server Mode feature of the ExpressQuantumGrid control. Both Advantage Database and PostgreSQL are now supported. There is also now support for in-place editing and banded table views when using Server Mode. But one of the most welcome improvements, I think, is the new capability to specify custom SQL for the SELECT statement that the Server Mode data source components will use. When I last blogged about ExpressQuantumGrid Server Mode, the most vocal feedback was the need to specify custom SELECT statements. Until now this was only possible using Views within the underlying database. 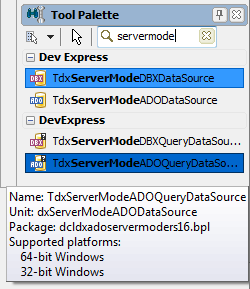 But starting with 12.2, DevExpress has introduced two new entries to the collection of Server Mode components to support using custom queries: TdxServerModeADOQueryDataSource and TdxServerModeDBXQueryDataSource. These are counterparts to the existing data source components that feature a SQL property for specifying the SELECT statement. To see how easy this is to put into practice, download an open my sample from this blog post. Make sure you’ve also created a database and used the contained SQL scripts to create and populate the LotsaRows table. Open Unit1 and select the Design tab. Delete the existing TdxServerModeADODataSource and replace it with a TdxServerModeADOQueryDataSource. 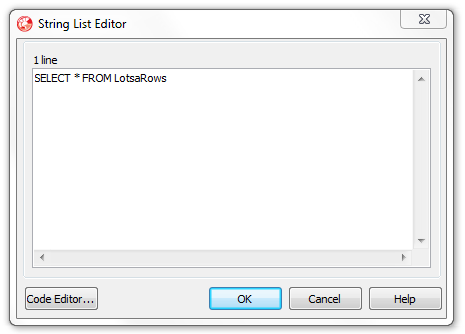 With the SQL statement specified, click the drop down arrow next to KeyFieldNames and select the ID column. Finally, set Active to True. That’s it for setting up the TdxServerModeADOQueryDataSource. 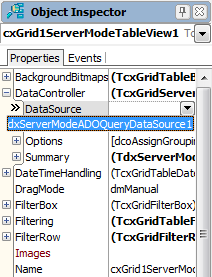 Now, select the Server Mode table view on the form and bind it to the TdxServerModeADOQueryDataSource using the DataController.DataSource property. At this point you should see that the project is working again more or less as it did in my previous blog post. A million rows of data show, quickly, within the TcxGrid control, featuring fast grouping and sorting. To actually see the new feature in practice, add a new TcxCheckBox to the main form, adjusting the grid control and giving it a proper caption. And that’s it! By swapping out the existing TdxServerModeADODataSource for its query-enabled counterpart, we can now specify a custom SQL SELECT statement and still benefit from “blazing fast” population, sorting, and grouping of one million rows of data. You can download the updated Delphi sample source code here. This entry was posted in Developer Express, Development, Embarcadero Delphi on December 28, 2012 by Nathanial Woolls (Nate). 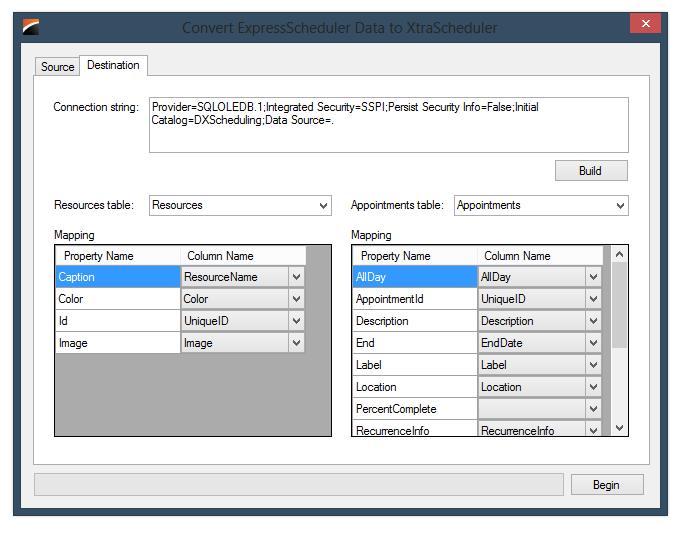 Express2XtraScheduler is a .NET solution consisting primarily of two assemblies and a WinForms utility that simplify importing database data from the format stored by the DevExpress VCL ExpressScheduler into a format supported by the WinForms XtraScheduler control. The solution also contains two simple applications that allow testing both VCL and WinForms scheduler data: ExpressSchedulerApp and XtraSchedulerApp. The source code for the Express2XtraScheduler solution is available immediately on this public Git repo hosted at Bitbucket. This entry was posted in Developer Express, Development, Embarcadero Delphi, Microsoft .NET on December 27, 2012 by Nathanial Woolls (Nate). 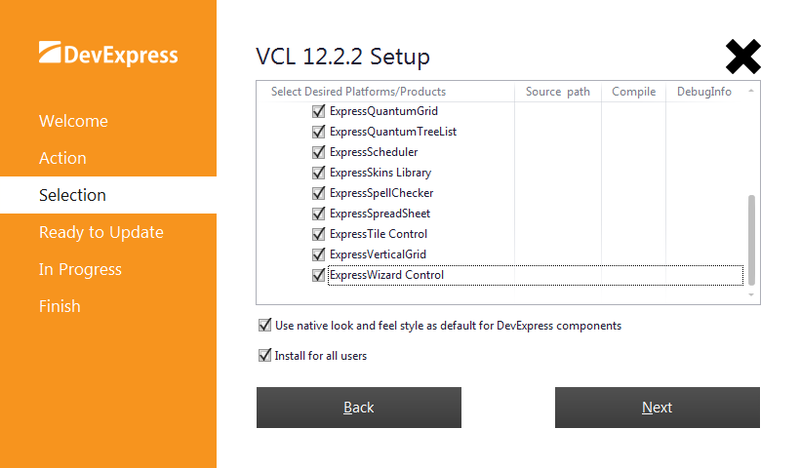 Version 12.2 of the DevExpress VCL controls contains the long awaited ExpressWizard control. DevExpress released a WinForms version, their XtraWizard control, over four years ago. They have now delivered a native version of this same control for the Delphi VCL. You can design dialogs that conform to either the Wizard 97 or Wizard Aero standard… creating standard based UIs has never been easier. Cutting-edge interfaces are only a few clicks away and developers can be certain that their wizard control will look and feel the same as all other DevExpress controls within their applications. By using DevExpress fade in/fade out effects, developers can easily enhance their wizards during page transition operations. It’s worth noting that the ExpressWizard control is a new product in the VCL subscription. This means that, when installing 12.2, you should select “Modify and Update” rather than simply “Update”. This will allow you to select ExpressWizard for installation. To get started with the ExpressWizard control, create a new VCL Forms Application in Delphi. Next, use the File, New, Other menu item to display the New Items dialog. Select Delphi Files on the left. On the right you’ll see a new entry: DevExpress 12.2 Wizard Form. Select this item and click OK.
A new form descended from TdxWizardControlForm. This is necessary to support the Aero glass features of the TdxWizardControl (similar to the TdxRibbonForm). The TdxWizardControl is also found on the component palette and can be dropped on any form. However, if you want to use the Aero style wizard, you’ll need to change your form’s ancestor. Starting in this manner (versus the template) will also give you an empty wizard control with no pages. To check out the basic features of the wizard control, I’d like a total of three pages: a Welcome page, an Agreement page, and a Finished page. For the Agreement page, I’d like the Next button disabled until the user checks a checkbox. I’d also like the wizard to use the Aero style rather than the Wizard 97 style. 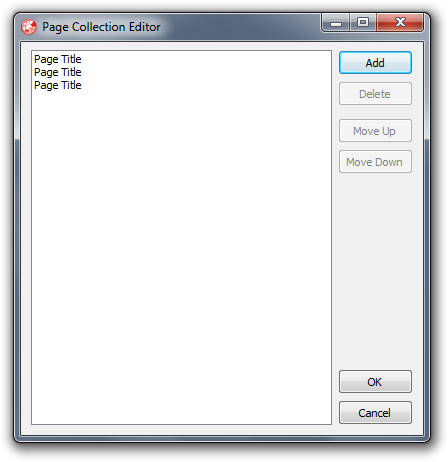 Pages can be added to the wizard control in two ways, both available from the TdxWizardControl and TdxWizardControlPage context menus. 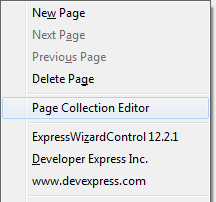 You can either click New Page directly, or click Page Collection Editor to display a dialog for managing the wizard pages. Using one of these two methods, add two new pages to the TdxWizardControl. As with the rest of the DevExpress VCL controls, the designtime editors and experience are top notch. You can actually click on the Next and Back buttons at designtime to switch through the wizard pages. Use the Next and Back buttons to select each wizard page. Then, adjust the Header.Title property so that the pages read Welcome, Agreement, and Finish. You can also adjust the Header.Description property, but this line of text will not be visible when using the Aero style wizard. 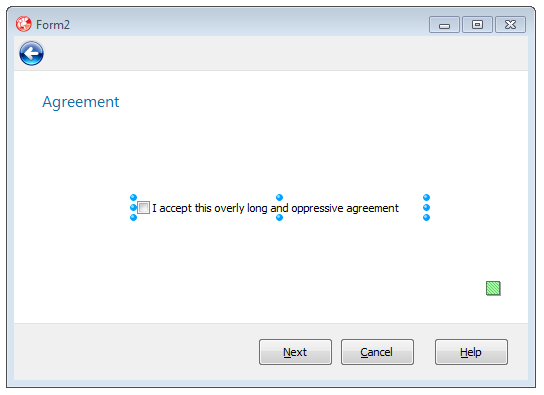 Next, add a TcxCheckBox to the Agreement page in the wizard and adjust its Caption property to indicate accepting the agreement. Click Run (or press F9) to check out the new button style. 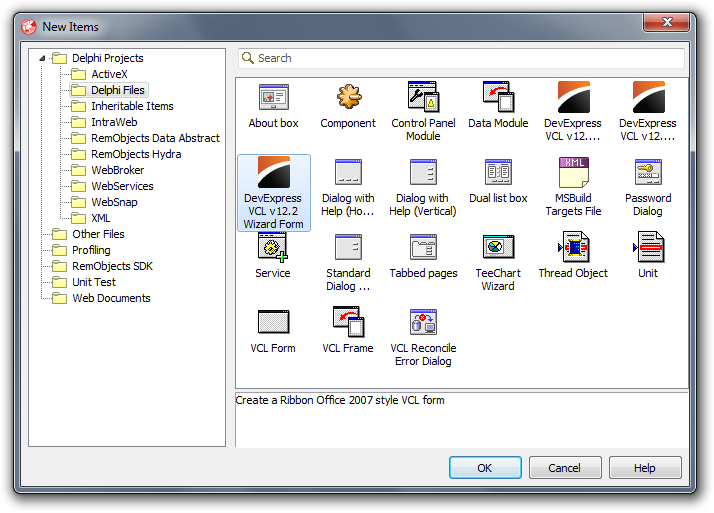 Click the TcxButton to show the wizard dialog. You’ll see that, with no code, you can click Back and Next to navigate through the pages. In addition, the Back button automatically disables when you are on the first page. Also, the Next button caption automatically changes to Finish when you are on the last page of the wizard. However, clicking Finish and Cancel do not currently do anything. In addition, we need some code for our “agreement” and the wizard is still not the Aero style. If you run the application again you’ll see the wizard is now functional. It starts on the Welcome page, and the Next button is disabled for the Agreement page unless the checkbox is checked. Finally, clicking Cancel or Finish dismisses the dialog. Also, notice that each screen of the wizard fades in and out smoothly. Very nice! You can download the Delphi source code for this example here. This entry was posted in Developer Express, Development, Embarcadero Delphi on December 18, 2012 by Nathanial Woolls (Nate).